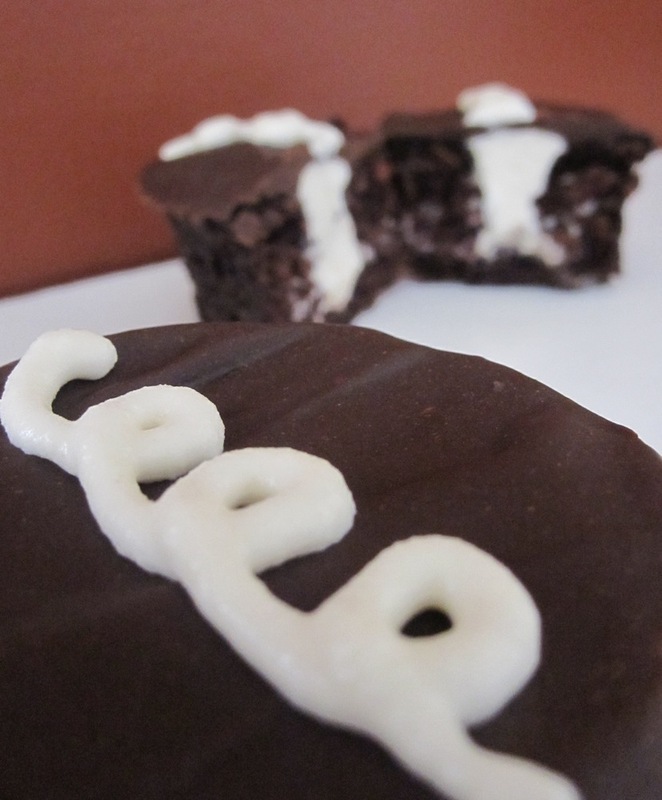 hostess cupcakes! the childhood treat, which also happens to be the best-selling snack cake in history (according to wikipedia), is known by its chocolately cake, cream-filled center, + signature squiggles. i ran across some in the grocery store + almost bought them, remembering how delicious they were when i was young. then i thought, hey, i bet i can make a tastier, healthier, more-natural version at home. while i thought my idea was totally original, a quick google search revealed that many before me had thought the same – there were lots of recipes, blog posts, + pictures devoted to homemade hostess cupcakes. so, i found a recipe that looked good, picked up the ingredients, + got down to business. the result is insanely tasty. while the recipe is easy to follow, i’ll admit that it has a lot of steps + is fairly time-consuming. but it is completely worth it, i promise. everything about this cupcake is delicious – the cake itself, the rich ganache, + (my personal favorite), the marshmallow filling. also, they’re so darn cute! i know lots of you are always looking for a new dessert to try – how ’bout these? for icing on top **note: i had enough of the marshmallow filling left over to use for the decorative swirls on the top, so i skipped making this icing. place oven rack in the center of the oven and preheat to 350 degrees. place paper liners in muffin tin for 24 cupcakes. place sugar + 1 cup of water in a saucepan. bring to a boil, stirring until the sugar dissolves, about 3 minutes. pour into a large bowl. add the chocolate + butter + let sit, stirring occasionally, until the chocolate is melted + the mixture has cooled slightly. stir in the vanilla. sift together flour, baking soda, baking powder + salt in a bowl. beat the eggs into the chocolate with a mixer, then stir in dry ingredients. divide the batter evenly between the prepared pans (about 1/4 cup batter per cupcake) + bake until a toothpick inserted in the center comes out clean, about 20-25 minutes. the cupcakes will sink in the middle slightly. cool in the pans for 25 minutes, then transfer to a rack and cool completely. while cupcakes are cooling, make the filling. using a mixer, cream the butter until light + fluffy. beat in 1/2 cup confectioners’ sugar. add the vanilla + 1 tablespoon heavy cream + beat until smooth. alternating between batches, beat in the remaining 1/2 cup confectioners’ sugar + 2 tablespoons heavy cream. beat in the marshmallow creme. refrigerate until ready to use. place the chocolate in a stainless-steel bowl. heat the cream + 1 tablespoon butter in a saucepan until just boiling, then pour over the chocolate. let stand for 5 minutes. whisk until smooth. add 2 teaspoons vanilla; let stand until cool but still glossy + liquid. spoon the marshmallow filling into a pastry bag with a medium star tip. insert the tip into the center of each cupcake top; fill until the cupcake is heavier (do not overfill). it’s okay if some of the filling peeks out, it will be covered by the ganache. 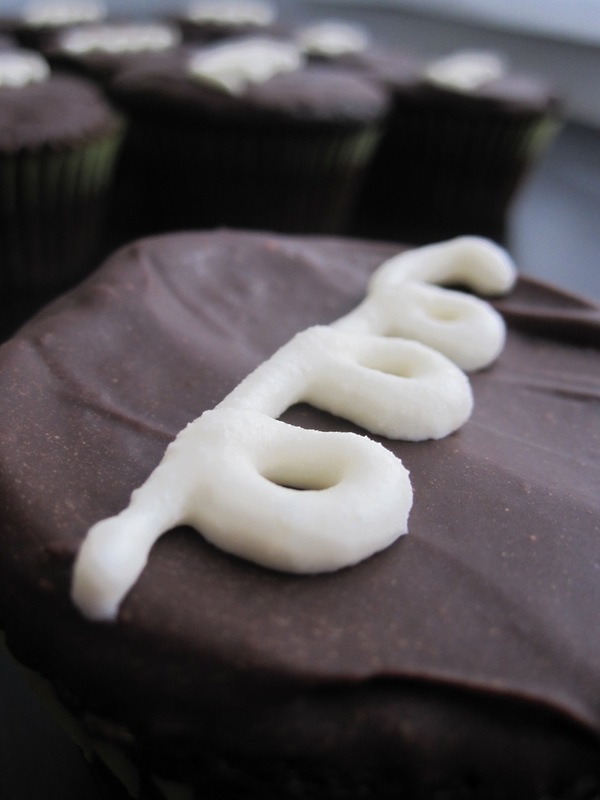 spoon a little ganache on each cupcake + lightly spread with an offset spatula or a knife. chill for at least 15 minutes. meanwhile, prepare the icing: using a mixer, beat the remaining 1 stick butter, 1/4 teaspoon vanilla, milk + confectioners’ sugar until smooth, adding more milk if needed. spoon into a pastry bag with a small tip. pipe onto the cupcakes to decorate. Yours turned out so cute! I’m so glad you liked them – they are fun to make aren’t they? Love this. who didn’t love these growing up? yes! + the great thing is that this a healthier, more natural alternative to the actual hostess brand ones. you should try ’em for your kiddos! you can absolutely tackle this – the process is lengthy but the steps are all easy. it would be a good project for a lazy weekend afternoon (or a snow day, although hopefully we won’t have too many of those this year!) let me know how they turn out if you try ’em! I’m so impressed! They’re perfect! And I bet they taste wonderful. I loved these cupcakes when I was growing up. I definitely plan on trying this recipe. I love the idea of possibly making mini versions! Please share a picture if you end up making minis. i think i will make the mini version tomorrow. they are pretty rich, so i fear that the full-size ones would drive the kiddos into a sugar-induced craze! i’ll take pics once i’m done! These are too cute! I’m currently obsessed with filled cupcakes so I’m all about these! leah, you are going to *love* these! i’d love to see pics + hear how you liked them if you make them! just found your blog and am loving all your recipes and ideas! and these cupcakes sound sooo good looking forward to making with my kids!